Switch version due out on August 9 in Japan. Level-5 has launched the official Japanese website for Layton’s Mystery Journey: Katrielle and The Millionaires’ Conspiracy DX, its newly announced Switch version of its mystery solving fantasy adventure game. Solve mysteries with greater comfort on a higher quality screen than the 3DS version. Begin your great adventure of mystery solving. The “Nazotoki Charm” toys released by Takara Tomy will work with the game through NFC correspondence. Touch the Nazotoki Charm to the Switch the get new costumes for Katrielle. The loupe used by Katrielle in the anime will be included with the physical edition in limited quantities as a Nazotoki Charm toy. By touching it to the Switch, you can get a costume themed after Katrielle’s loupe color. The digital edition will include the same “Aroma-Style Dress” included with the 3DS version of the game. Layton’s Mystery Journey: Katrielle and The Millionaires’ Conspiracy is currently available worldwide for 3DS, iOS, and Android. 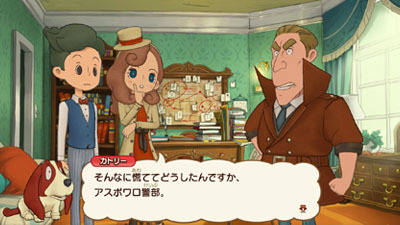 Layton’s Mystery Journey: Katrielle and The Millionaires’ Conspiracy DX will launch for Switch on August 9 in Japan for 5,980 yen (6,458 yen with tax).